A set of 6 Soapnut shampoo bars. 6 assorted 90g shampoo bars to try. 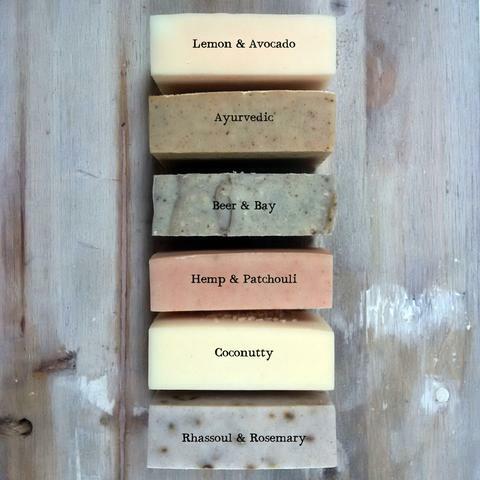 Natural, vegan shampoo bars. Hand made in the UK. It's an old concept, a soap bar you can use on your hair but it actually works. This shampoo bar is a great and convenient way to wash your hair, face and body. It also makes a great shaving bar too! INGREDIENTS Coconutty: Olea europaea (olive) fruit oil, Organic Sapindus mukorossi (soapnut) fruit extract, Organic Cocos nucifera (coconut) oil, Organic Cocos nucifera (coconut) milk, Organic Ricinus communis (castor) seed oil, Organic Persea gratissima (avocado) Oil, Sodium hydroxide*, Organic Theobroma cacao (cocoa) seed butter, Organic Oryza sativa (rice bran) oil, Cocos nucifera (coconut) dessicated. INGREDIENTS Hemp & Patchouli: Organic Sapindus mukorossi (soapnut) fruit extract, Olea europaea (olive) fruit oil, Organic Cocos nucifera (coconut) oil, Organic Ricinus communis (castor) seed oil, Sodium hydroxide*, Organic Theobroma cacao (cocoa) seed butter, Organic Cannabis sativa (hemp) seed oil, Pogostemon cablin (patchouli) leaf oil, Thuja orientalis (cedarwood) leaf oil, Pelargonium graveolens (geranium) oil, Capsicum frutescens (cayenne pepper) fruit powder, Kaolin (and) Illite (and) Red iron oxides, geraniol**, citronellol**. NGREDIENTS Beer & Bay: Olea europaea (olive) fruit oil, Organic Sapindus mukorossi (soapnut) fruit extract, Organic Cocos nucifera (coconut) oil, Organic Ricinus communis (castor) seed oil, Organic Persea gratissima (avocado) Oil, Sodium hydroxide*, Organic Theobroma cacao (cocoa) seed butter, Vegan beer, Montmorillonite (argile) clay, Lavandula angustifolia (lavender) oil, Rosmarinus officinalis (rosemary) leaf oil, Laurus nobilis (bay laurel) oil, Tocopherol (vitamin E), linalool**, limonene**, geraniol** eugenol**.